It was not until I sat down to write this review—in so much as I yet feel myself capable of calling my scribbled thoughts about poetry a review—that I realized I’m following a piece about Ghassan Zaqtan’s latest novella, Where the Bird Disappeared, with a look at the latest collection of poetry by Fady Joudah, Footnotes in the Order of Disappearance. I came to Joudah first as a translator of Zaqtan’s poetry so I was not unaware of the concurrence. But I am typically reading at least two books of poetry and two books of prose at any given time, so the crossover is never so obviously bound, thus it is only now that I’ve become aware that the titles of both books include a form of the verb to disappear. A timely happenstance. However, although it is impossible to underestimate the importance Ghassan Zaqtan’s influence on an entire generation of Arab poets, Joudah included, the experience offered by the latter’s work is distinctly his own. forging a lyric that works at the crosscurrents of reportage, myth, and dream where false imagined boundaries—of gender, nation, family—fray and unfold, and there are possibilities other than ‘to go mad among the mad / or go it alone’. . . (his) gifts for articulating the intersections of bewilderment, tenderness, rage, and grief are fully alive here. aligned like Muslims in prayer. a butterfly announcing a wolf. in concentric circles. The weekends were lonely. zipped up as if a mass grave had been disinterred. had cloth over their eyes as if they’d just been executed. he was sixty-seven, a veteran of more than one war. tend me, at least once, without knowing it. Over dinner we spoke of the game of recurrence dissolving into an old dog’s tail, loquacious desire far from the borders of the body, yet is the body’s. What’s inside and doesn’t come out to skin or what’s outside and doesn’t touch us. Victims, we told ourselves, will inherit the future one day, but souls will linger distant from redemption. Don’t follow the signage and keep your eyes on the phrase. News of the explosion will hang around. The hell of pictures on the web. Faces of the dead on Facebook will wait for your walk home. A woman who awakened your first lust when you were a kid was killed in the morning while talking to her sister on the phone. First a blast then stillness. You were late to dinner. You had lost your way to the restaurant. You couldn’t have known she had just died, and what you thought were Klee’s paintings in the gallery clawing your afternoon nerves was her calling your name one last time. Poetry, at its best, invites re-engagement. Demands it, even. I was so enamoured with the anatomy of Joudah’s wordplay that, on my first passage through Footnotes in the Order of Disappearance, I was so intrigued to see where his wonderings would lead that I did not linger as I might have on another initial journey. I read this book with an unexpected urgency. But as I returned to it with an eye to sorting out my responses, I encountered new depths, new heights of emotion. And at times in the seemingly simplest passages. For me, the prose poems—“Horses,” “An Algebra Come Home,” and “Alignment” to name a few—hold a particular power, but the entire collection is so strong, so varied, that there are boundless rewards to be found in the generosity of Fady Joudah’s pained and passionate poetics. 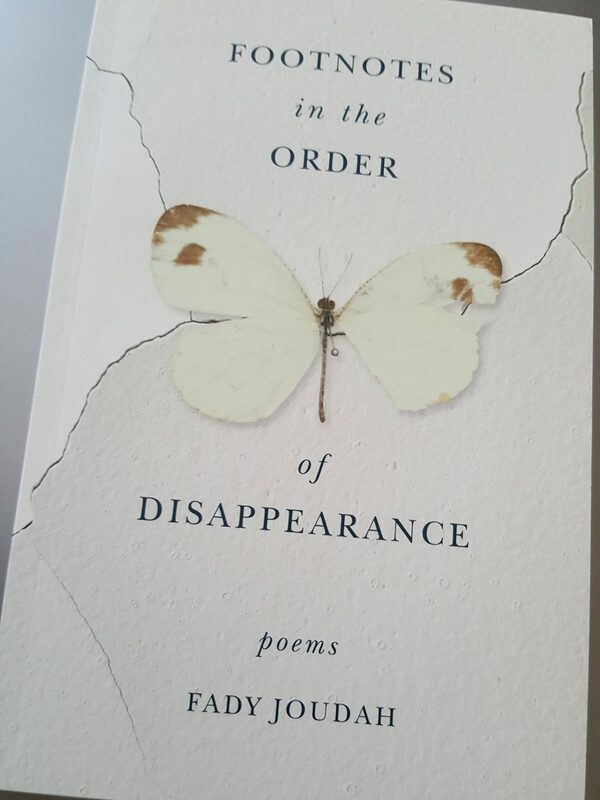 Footnotes in the Order of Disappearance is published by Milkweed Editions.